Failure is not an option — except when you’re enacting accelerated stress tests to push your products to their operating limit. In that case, failure is not just inevitable. It’s invited. The HALT and HASS testing processes stand in a realm of their own when it comes to finding and identifying product defects. These two models are cousins in a broader strategy to better understand the operating margins of goods before they hit the market and before any potential defects can cause widespread field and brand mayhem. It’s not just in a manufacturer’s best interest to employ HASS and HALT procedures to build best-in-class products. It’s about the reliability and integrity of the design itself across its entire lifecycle. Procuring HALT and HASS testing for your products are essential to realizing what true product performance is — and how you can deliver it. Let’s see how. Highly Accelerated Life Testing (HALT) has one central function — to rigorously expose the weaknesses of a product at its earliest possible lifecycle, determine the source of the weakness, then address and correct it, ultimately enhancing that product’s operating and destruct limits. In other words, a HALT testing process proactively makes a product more mechanically durable and reliable beyond its operating specifications. This is an essential qualifier, as most other trial verifications and product procedures test the soundness of the operating specifications themselves but may not necessarily go beyond them. For manufacturers, products with robust stress defenses and fatigue endurance are less likely to face recalls, less likely to experience frequent warranty claims and more likely to reap long-term profits. HALT tests provide manufacturers, designers and engineers with speedier insights, as they initiate product failures in a matter of hours or days rather than weeks with other testing methods. HALT tests are cost-effective and profit-enhancing, mitigating product defaults at their earliest possible stages. In fact, research has shown those who catch product anomalies early during the design phase only face correction costs three to eight times the cost of the unit product. Errors that slip by into the operational or in-market phase? A whopping 29 to 1,500 times the cost per unit. HALT testing procedures are ideal for new products, such as those in the design, procurement or immediately before the production phase, as well as re-designed equipment where significant fabricated components have been introduced, such as a model with new soldering joints. In both these cases, the ideal remains to address and mitigate product defects as early as possible — before they become real-world problems. Highly Accelerated Stress Screening (HASS) may sound similar to HALT, but it pivots the focus from finding defects during the design phase to finding defects during the production or manufacturing phase. HASS aims to identify glitches, defects or deficiencies that are direct results of product fabrication. 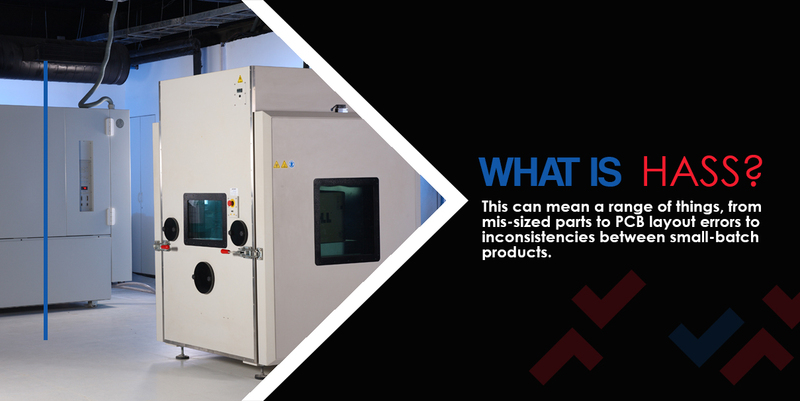 This can mean a range of things, from mis-sized parts to PCB layout errors to inconsistencies between small-batch products. Yet HASS testing is not mere quality control. Like HALT, it develops stress profiles that go beyond listed production speculations. Often, HASS results reveal hidden flaws or deeply embedded irregularities a routine pass/fail test wouldn’t detect. The earlier these defects get caught, the quicker the patch and the less impact on product release. HASS testing procedures are most pertinent to consumer electronics and similar technological devices that are expensive to recall and near-impossible to rebrand. 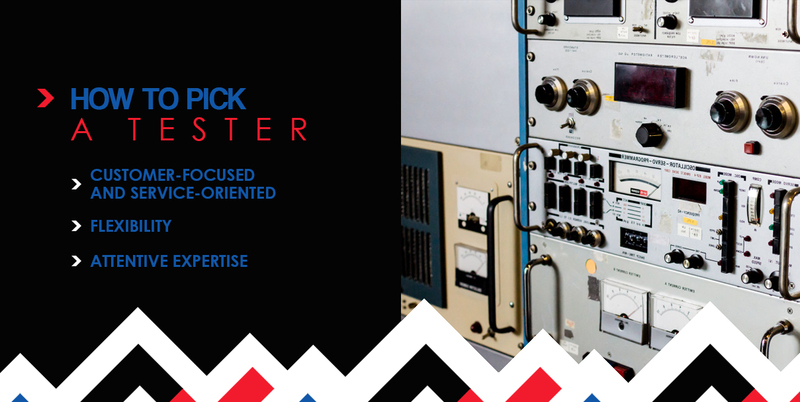 HASS tests are also advantageous to particular industries and their mission-critical physical assets, such as transportation, communications and the military. HASS tests can be ongoing and customizable. They are just as tightly monitored as HALT procedures, together lending manufacturers and engineers a complementary approach to best-in-class products. What Does the HALT Testing Process Look Like? 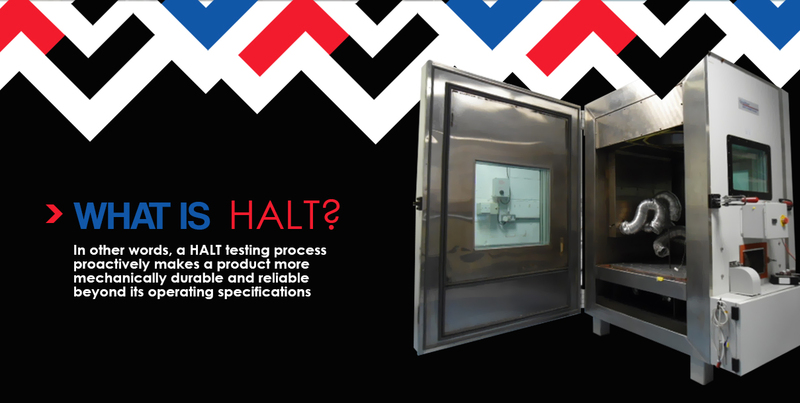 The HALT testing process is a series of increasing stress trials held within a specialized HALT test chamber. That chamber can initiate a number of stimuli conditions, typically across five different categories — hot thermal, cold thermal, rapid thermal variation, vibration and combined stress environment. As the HALT test advances, so too do the forces and rates of the stimuli exerted on the product. The main categories a product will be tested on are described below. Hot thermal stresses gradually test the product or device’s maximum operating temperature. While such temperatures get outlined in initial design specification, HALT tests can push temperature limits by testing the device under a range of extreme heat, heat duration and rates of elevated heat. All this provides burn-in information, as well as how a product changes or operates in hotter conditions. Likewise, cold thermal HALT tests identify a product or device’s minimum operating temperature. Cold thermals accelerate the aging process of a device and can trigger unique product malfunctions that must be addressed early in the lifecycle. Just as hot thermal trials give deliverables on a set of operating conditions, cold thermals can be adjusted for different rates, durations and levels to see how a product or device reacts. Thermal fluctuations round out the temperature-based trials conducted during HALT testing processes. While logistically it is unlikely for most products to undergo this kind of temperature variability, it augments the need for developers and engineers to create insular and stable products that can withstand sudden environmental changes. Testing under fluctuating temperatures, humidities and temperature-adjusted pressures gives further insight into a product’s holistic endurance and resilience. Shock and vibration tests are critical to asses a product’s maximum operation vibration level and mechanical strength. They are usually performed using a six-axis vibration plate, meaning the tested product will roll, bounce, spin and move in six “free movement” directions. Such thorough vibration analysis is essential not only to give insight into the physical durability and endurance of the product as a whole but also to identify ways a current design or system carries mechanical defects or parts prone to instability. Early vibration and shock HALT tests aim to mimic the impacts of elements like product transportation, while more custom shock tests underscore the physical integrity of a product during brute-force scenarios. Last but not least, a HALT tester will perform a combined stress test that merges any of the stimuli from above. This paints the most comprehensive and system-critical portrait of weak spots and defects for product engineers and designers to address. It’s important to note a few measures shape the way these HALT procedures occur. Namely, two fundamental HALT testing guidelines form a trial’s parameters — practical limits and fundamental limits. HALT Practical Limits: Stimuli should only be increased up until the point of practicality within a product parameter. For example, there is no need to conduct increased hot thermal tests when a product or product component has already reached a melting temperature. HALT Fundamental Limits: Stimuli should only be increased up until the point where the technological fundamentals of a product have been reached. For example, warranty parameters can be better defined using the results of a product’s vibration tests, with intuitive and research-backed offerings and restrictions fitting for a device. With HALT testing, you go beyond standard pass-or-fail qualification tests. In fact, there are no pre-set passing criteria for a HALT procedure at all. Instead, testers aim to replicate the inevitable wear-and-tear of products over the years in just a few days — or even hours. HALT testing processes are fundamentally meant to procure product or system failures in a controlled environment, then map out the solutions to fix them. What Does the HASS Testing Process Look Like? HASS testing utilizes many of the same procedures and stimuli HALT tests do. However, one essential difference to note is that HASS tests will not conduct the same level or duration of inputs, meaning the temperatures, vibrations, pressures and combinations employed will be measurably reduced at this stage of the product lifecycle. The reasons for the reduction are intuitive. Products and goods already at a production phase will court more fine-tuned design details and subsequent audit limitations. These restrict the functionality of extreme HALT-inspired testing procedures at this stage, even rendering some of them counterproductive. What’s more, the nature of a HASS test is not to induce comprehensive failure analysis through the most severe situations, but rather to place products in altered states of actual use or service. These states will be subject to more atypical stimuli and harsher conditions, yes, but the emphasis is still on practical boundaries — not defining the operating limits. Instead, many designers and engineers do well to complement their HASS testing with initial, in-depth HALTs. Because HASS catches defaults and failures at a latent product stage, and because it focuses on preemptive, pre-market shortcomings, the testing procedures are tailored accordingly. A product-specific HASS profile is created using operational limits analyzed and defined by HALT. This testing profile does not push the boundaries quite like HALT but does enact controlled, gradual stressors onto the core subassemblies of the product. Subassemblies are typically preferred, as many full-fabricated products at this stage are ill-suited to have key components tested or contain aesthetic fixtures that render such tests too tricky when whole. A manufactured product undergoing HASS analysis will likely see dialed-down versions of hot, cold and cycle thermal procedures, vibration and free motion tests and combined environmental tests. Dialed-down hardly means ineffective, though. Components are still analyzed under the same scrutinous principles, only this time to ensure latent problems don’t complicate next-step fabrication or reach the consumer. Other stressors might be tested on the product’s subassemblies to gain further knowledge, such as open-voltage conditions or full-power conditions. Failure analysis is the last step in a typical HASS testing process. If abnormalities or defects are found across testing cycles, data from sensors in the test chamber will then be analyzed, tracing the relevant manufacturing or fabrication weak spot for that particular part or piece. In this sense, HASS testing procedures are very similar to other environmental stress screenings. Spotting and correcting flaws while maintaining a profitable time to market, they ensure large batches of products are not fabricated carrying these same defect risks. This translates into lowered costs of ownership and product warranty liabilities as well as creates a more reliable, responsible market product. Customer-Focused and Service-Oriented: A lab tester should work as hard as possible to identify your exact testing needs, fit your schedule and exceed the expectations of past one-and-done test cycle jobs. You’ll get an immediate sense of a lab’s customer-service orientation during your initial phone calls or consultations and quickly know whether they’re in this for the products or the profit. Flexibility: Have a tight testing deadline or facing a sudden rush release? Certain labs might have rigid operational hours, while others can and will tailor their testing services to match your schedule. This sort of flexibility extends to the product profiles they create, drafting truly tailored and comprehensive testing parameters rather than checking a series of standard HASS or HALT procedural boxes. After all, you can’t predict what these tests will reveal. Picking a tester that understands this fluidity and adapts to unforeseen events is paramount. Attentive Expertise: A lab’s size, brand name or years in operation won’t necessarily translate into top-tier expertise. Rather, a lab’s acumen shines when they provide a sort of closed-loop consultation, with services and insights that bridge failure analysis with corrective action plans rather than identifying problems and leaving you to fix them. You’re not just making a product — you’re engineering a solution. 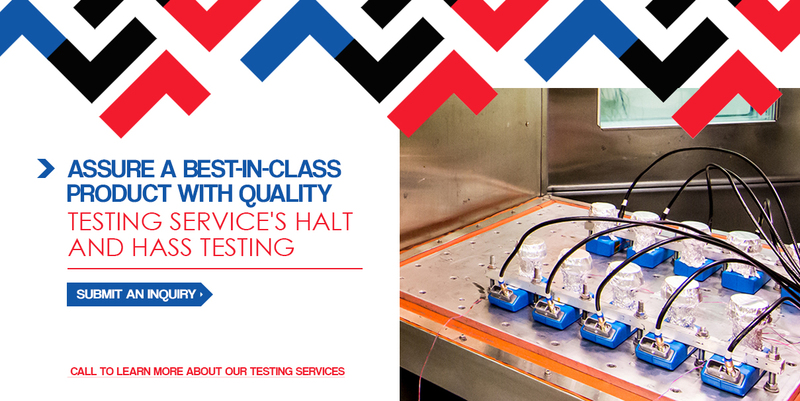 Quality Testing Services in Huntington Beach, CA does everything in its power to ensure you’re manufacturing a product you can be proud to put your name on through our industry-leading precision-testing services, HALT and HASS analysis and much more. Submit an inquiry or call to learn more about our testing services at (714) 903-1155. We can’t wait to partner with you. 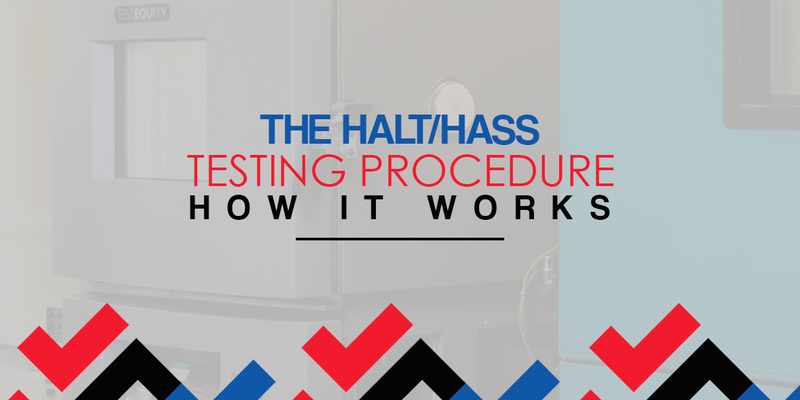 Next PostHALT/HASS Testing Guide: What Is HALT/HASS Testing?